For Introductory World Regional Geography/Regional Geography Courses. 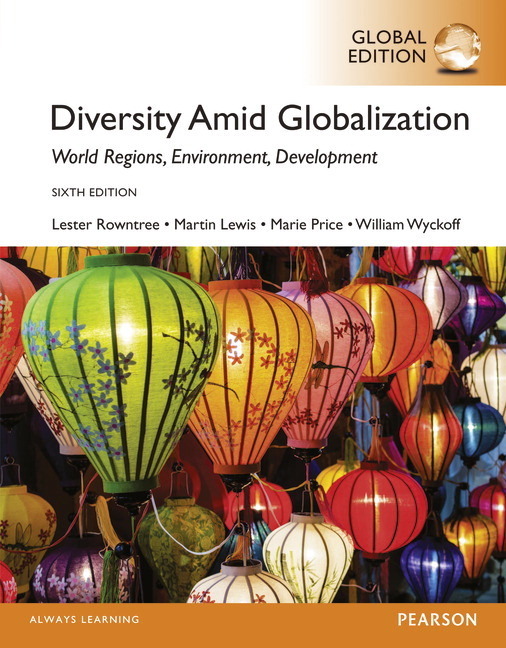 Diversity Amid Globalization takes students on a journey into the connections and diversity between people and places—the contrasting regions of the world—within thematically organized regional chapters. With an arresting visual layout and new and updated content and maps throughout, the text maintains and strengthens its hallmark thematic organization and focus on globalization, while encouraging students to participate in the material using a number of stimulating, interactive learning tools. This package includes MasteringGeography, an online homework, tutorial, and assessment program designed to improve results by helping your students quickly master concepts. The book and MasteringGeography work together to create a classroom experience that is tightly integrated to help students succeed both in and outside of the classroom. MasteringGeography should only be purchased when required by an instructor. Please be sure you have the correct ISBN and Course ID. Instructors, contact your Pearson representative for more information. NEW! Google Earth Video Virtual Tours: A few QR codes per chapter allow students to use their mobile devices to link from the print book to online Google Earth video virtual tours, providing just-in-time visualization of places and regions. Also available in the MasteringGeography Study Area and Item Library with assessments. NEW! Author Blogs. Students scan QR codes in the books to access the two author blogs for just-in-time updates on places and regions and additional data and extension material. This feature helps keep the book dynamically updated. Also available in the Study Area of MasteringGeography. Updated Cityscapes: These features now include Quick Response (QR) codes that link to Google Earth video virtual tours of these cities, which students can access with their mobile devices. NEW! End-of-Chapter Visual Analysis Activities: New, higher-level Bloom’s visual analysis questions associated with each theme/section help students apply and synthesize their understanding–and provide opportunities for collaborative/group activities. NEW! Working Towards Sustainability: Students see just how sustainability initiatives apply to people, groups, and settlements across world regions. These new chapter features show the diverse applications of this increasingly important interdisciplinary concept, and highlight positive environmental and social initiatives and outcomes. NEW! Everyday Globalization: explore the global connections and impacts of globalization on the products and commodities that students use in everyday life. UPDATED! Exploring Global Connections case studies: All new topics with a focus on recent events, and additional coverage of cultural and environmental topics. NEW! Chapter “In Review”: The highly visual In Review two-page sections at the end of each chapter present a stronger focus on regional issues and globalization impacts. Organized around learning outcomes and incorporating visuals like maps, photos, and GIS and satellite images, and active learning questions for each theme, the new features synthesis of the core issues from the thematic sections, emphasize the impacts of globalization on the region, and show multiple different spatial scales. The result is a highly visual summary of the defining issues of the region. Expanded Coverage of Gender Issues, Food, Art, Music, Film, and Sports: These interesting and popular topics are more visible in the regional chapters. NEW and Updated Cartography: New data, cartography best practices, and most recent geopolitical events are included. Current Data: The latest science and statistics and associated imagery are incorporated, including data from the 2010 Census and the 2013 PRB Population Data. NEW! Region-Specific Learning Outcomes at the beginning of each chapter connect to Review Questions, end-of-chapter material, and MasteringGeography. NEW! Review Questions integrate lower level Blooms review questions at the end of each thematic section, to help students check their comprehension as they read. NEW! Questions in select sidebars provide students with active learning opportunities as they read through these thematic case studies. NEW! Focus on Fundamentals: More discrete basic geography information is integrated into Chapter 1, particularly concerning map interpretation, projections, and modern geospatial tools. Tone, Consistency, Continuity, and Connections: This edition features accessible language, a positive tone, and contemporary applications that will appeal to and engage today’s students. NEW! Updated MapMaster allow students to layer and customize various thematic maps to analyze spatial patterns and data at regional and global scales, similar to a static GIS. These activities include multiple-choice and short-answer questions organized by region and theme. NEW! Geography Videos: Video media from such sources as the BBC are now included in addition to the videos from Television for the Environment’s Life and Earth Report in MasteringGeography. Updated Encounter World Regional Geography: Google Earth activities, organized by region, theme, and question type, include updated data and media. NEW! Map Projections Media: New geography interactive tutorial media helps reinforce and remediate students on the basic yet challenging Chapter 1 map projection concepts. NEW! Geoscience Animations: These animations help students visualize important physical processes. NEW! GeoTutors. These highly visual coaching items with hints and specific wrong answer feedback help students master the toughest topics in geography.